Wireless charging. I really thought it would be available on all premium Android devices by now, but it seems manufacturers still aren't sure whether this should be a default feature or not. It's pretty disappointing that the new class of Nexi (pretty sure that's plural for nexus) opted for the UBS Type C or bust route. However, there are still a ton of devices on the market that sport inductive chargers. For the best wireless charging experience I always recommend using a three coil charger. The additional coils create a larger charging area and make for a more consistent connection. In other words, they are great for lazy people like myself that don't want the hassle of double checking to make sure their phone is actually charging when placed on a charging pad. Quality three coil charging stands usually sell in the $30-40 range, and sometimes as high as $60. Those prices are also often just for the charging plate, a power supply is an extra expense! 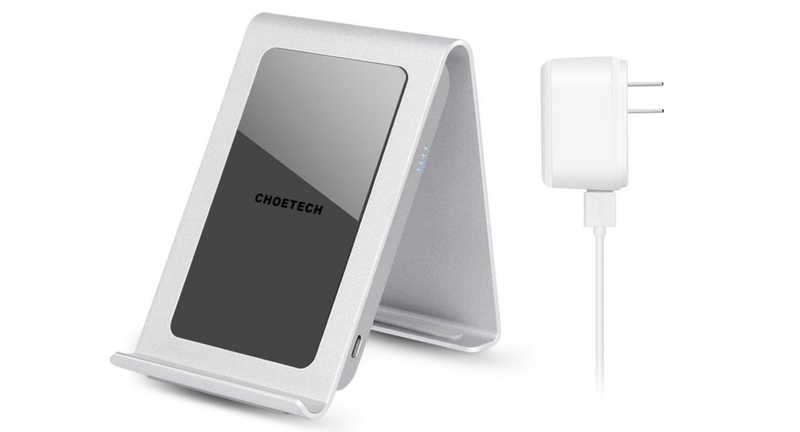 Well, today Choetech has a very solid deal on their 4.4 star rated wireless CHOE Iron Stand. You can pick one up, with an included 2A power supply, for just $27.99 after applying the $8 off coupon code ZNJUGMOI. The stand is quite attractive in my eyes, it's made of aluminum and will charge a device placed on it in either landscape or portrait position. I own a number of wireless accessories from Choetech and I've been impressed with their build quality and pricing. Aside from my recommendation, they also have a solid 18 month warranty on their devices that should help you feel secure in your purchase.